Not only that, eggs are a bargain food. The price of a dozen eggs in 1925 was about 60 cents and a pound of round steak was about 50 cents. Today, a dozen eggs can be bought for about $1.60 a dozen and a pound of round steak for $5.60. Clearly the cost of eggs has not kept pace with other changes in prices. If it’s possible for you to do, buy your eggs at a local farmers market. You will pay more per dozen, but the egg quality is likely to be better because the life of the chicken that produced those eggs is also likely to be much better. A great way to have ready-to-go eggs is to pickle them. Pickled eggs keep well in the refrigerator in the salty, vinegary brine. This particular recipes makes eggs that are are very pretty — “tickled pink” with a few slices of raw beet. Make up a jar on the weekend and enjoy them effortlessly through the week. If you put these pickled eggs on a salad, try my Creamy Balsamic Salad Dressing recipe, too. I like to use an empty 24-ounce jar that I saved after using the pasta sauce that came in it. The jar is the perfect size for 8 pickled eggs. That way you can pickle 8 eggs and still have 4 eggs left over for some other use. Of course, you can always use a quart-canning jar with room for 12 eggs. Just increase the recipe and make a full dozen. A great way to have ready-to-go eggs is to pickle them. Make up a jar on the weekend and enjoy them effortlessly through the week. 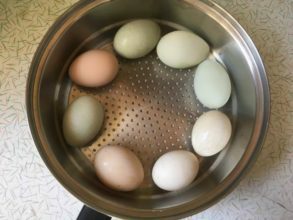 Boil the eggs in water until hard boiled, about 12 minutes, or you can steam them for 18 minutes. Once cooked, cool the eggs in a bowl of ice water. I find this a very convenient way to have perfect hard-boiled eggs. Peel the eggs. I have no tip for the best way to do this. Eggs just seem to vary on how easy or hard it is to peel them. It is okay if they don’t peel perfectly, i.e. if some the white sticks to the shell. You just don’t want pieces of shell left on the cooked egg after it is peeled. Add the vinegar to cooled salt water. Place the eggs and pieces of beet in an empty jar. Pour the vinegar/salt/water solution over the eggs. Place a lid on the jar, then place the jar in the refrigerator. 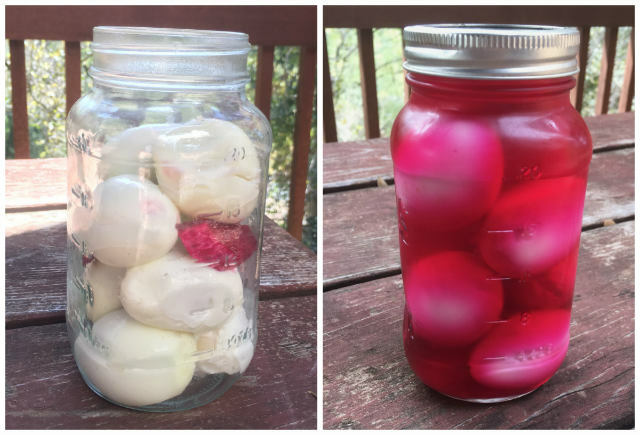 Wait 24 hours and start enjoying your pickled pink eggs. 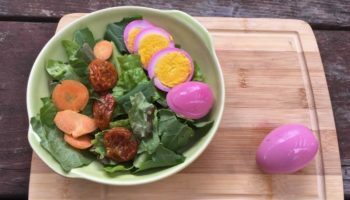 Serving suggestions: add slices of pickled egg to a green salad or just enjoy them plain. Nancy Teas-Crain lives in Alpine, California. She is a nutritionist and Weston A. Price Foundation chapter leader. After many years on a low-fat vegetarian diet, she made a complete turn-around after studying the work of Dr. Weston A. Price. She is now an enthusiastic supporter of the nourishing benefits of traditional foods and fats, especially butter. Currently she is writing a cookbook integrating her love of cooking, gardening, and home remedies. When not writing, she is enjoying her family of two boys, six ducks, four chickens, two cats, and her chiropractor husband, Darrel Crain.